Keeping up with the crypto mining economy is no easy task. We work with you to address your most critical business priorities. We are a team of crypto-mining experts that have been building and managing mines since 2011. Our end-to-end mining services help businesses design, manage and service profitable mining operations. Seamlessly setup, monitor and maintain your mining operation in one centralized interface. 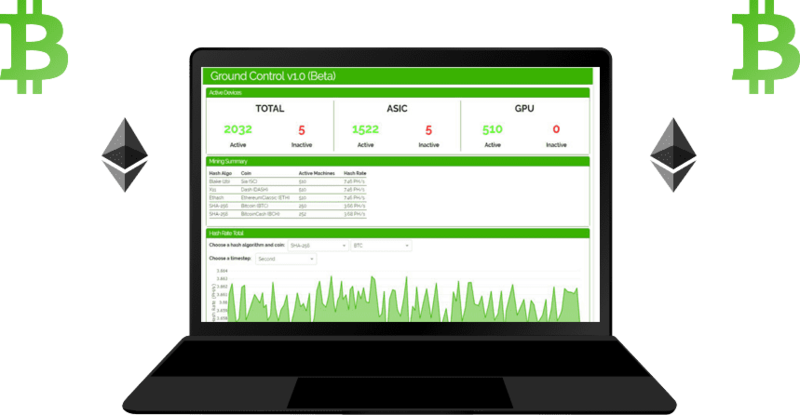 Ground Control provides advanced analytics, directs your attention to increase efficiency and gives you the flexibility to manage your operation from anywhere with just a few clicks. We make sourcing mining hardware easy: GPU or ASIC miners, networking equipment, electrical equipment, security equipment, shelving racks, power distribution and much more. We can assess your facility requirements and recommend appropriate hardware. It’s simple - your devices hosted at one of our partnered certified mining facilities. Get your rigs mining with a quick turnaround. Designing a mining facility? We help create and assemble the foundations for a profitable operation. Ensure your mine is performing at maximum efficiency by hiring Goldenstrike’s Certified Mining Engineers and Mining Technicians. Make large volume crypto trades securely with Goldenstrike’s approved OTC partners. Navigating crypto mining is difficult - See how we’ve helped provide clarity in an evolving industry. Our veterans guide, advise, and assist you. Copyright 2019 Goldenstrike Technologies Inc.